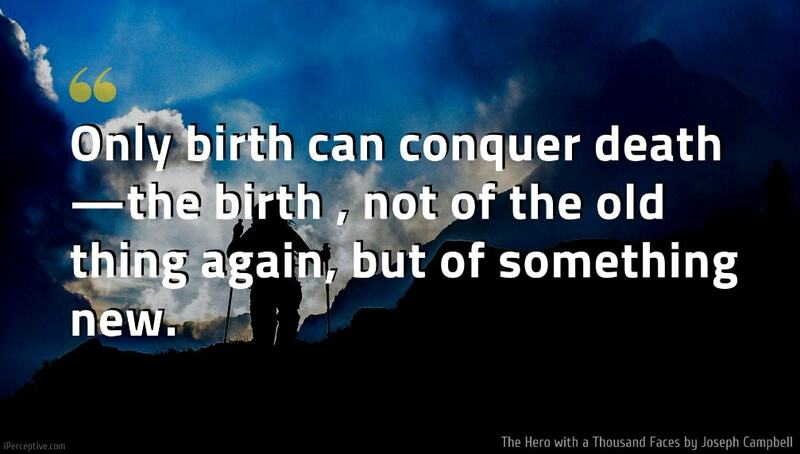 Only birth can conquer death—the birth , not of the old thing again, but of something new. By this the dreamer crosses to the other shore. And by a like miracle, so will each whose work is the difficult, dangerous task of self-discovery and self-development he portrered across the ocean of life. All that we see is but the reflex of a power that endures, untouched by the pain... a transcendent anonymity regarding itself in all of the self-centered, battling egos that are born and die in time. The latest incarnation of Oedipus, the continued romance of Beauty and the Beast, stand this afternoon on the corner of 42nd Street and Fifth Avenue, waiting for the traffic light to change. 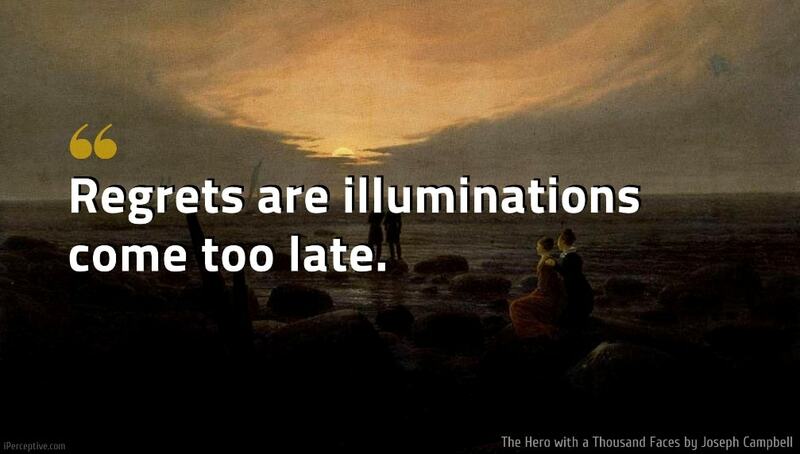 Regrets are illuminations come too late. Tragedy is an unfinished comedy. Not all who hesitate are lost. The psyche has many secrets in reserve. And these are not disclosed unless required. Perhaps some of us have to go through dark and devious ways before we can find the river of peace or the highroad to the soul's destination. 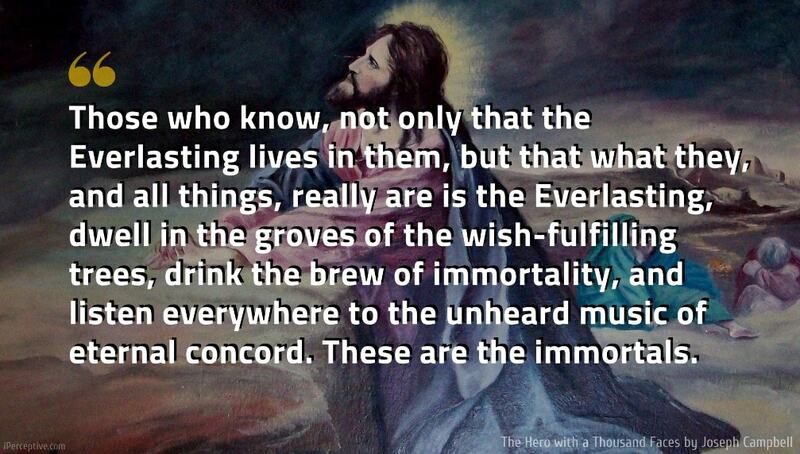 Those who know, not only that the Everlasting lives in them, but that what they, and all things, really are is the Everlasting, dwell in the groves of the wish-fulfilling trees, drink the brew of immortality, and listen everywhere to the unheard music of eternal concord. These are the immortals. The way to become human is to learn to recognize the lineaments of God in all the wonderful modulations of the face of man. Typically, the hero of the fairy tale achieves a domestic, microcosmic triumph, and the hero of myth a world historical, macrocosmic triumph. The two, the hero and his ultimate god, the seeker and the found, are thus understood as the outside and the inside of a single, self-mirrored mystery, which is identical with the mystery of the manifest world. The great deed of the supreme hero is to come to the knowledge of this unity in multiplicity and then to make it know. The first stage of the mythological journey, which we have designated the “call to adventure” signifies that destiny has summoned the hero and transferred his spiritual center of gravity from within the pale of his society to a zone unknown. The problem of the hero is to pierce himself (and therewith his world) precisely through that point; to shatter and annihilate that key knot of his limited existence. 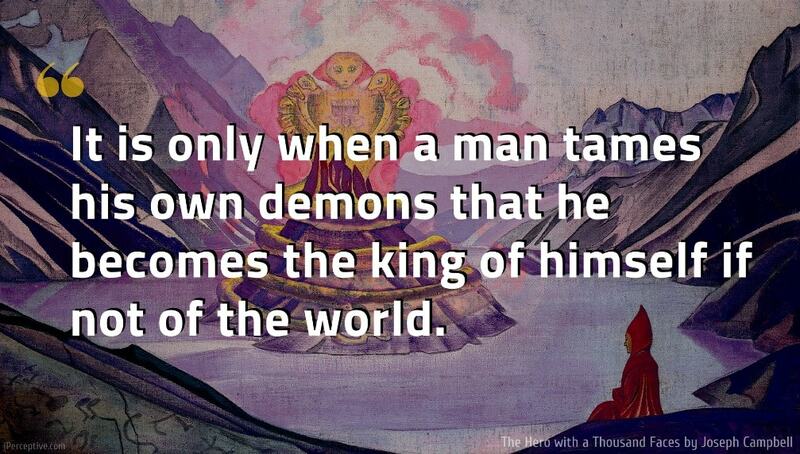 It is only when a man tames his own demons that he becomes the king of himself if not of the world. Instead of clearing his own heart the zealot tries to clear the world. The hero, the waker of his own soul, is himself but the convenient means of his own dissolution. The effect of the successful adventure of the hero is the unlocking and release again of the flow of life into the body of the world. 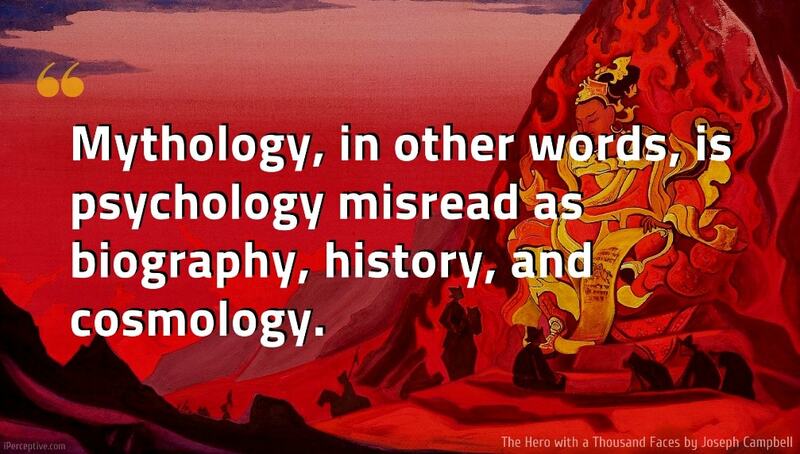 Mythology, in other words, is psychology misread as biography, history, and cosmology. Full circle, from to tomb of the womb to the womb of the tomb, we come. Wherever the poetry of myth is interpreted as biography, history, or science, it is killed. The hero of yesterday becomes the tyrant of tomorrow, unless he crucifies himself today. The boon brought from the transcendent deep becomes quickly rationalized into nonentity, and the need becomes great for another hero to refresh the world. For the bliss of the deep abode is not lightly abandoned in favor of the self-scattering of the wakened state. The problem of the theologian is to keep his symbol translucent, so that it may not block out the very light it is supposed to convey. The adventure of the hero represents the moment in his life when he achieved illumination, the nuclear moment when, while still alive, he found and opened the road to the light beyond the dark walls of our living death. The contemplation of the life thus should be undertaken as a meditation on one’s own immanent divinity, not as a prelude to precise imitation, the lesson being, not “Do thus and be good,” but “Know this and be God. Symbols are only the vehicles of communication; they must not be mistaken for the final term, the tenor, or their reference. No matter how attractive or impressive they may seem, they remain but convenient means, accommodated to the understanding. Your life is much deeper and broader than you conceive it to be here. What you are living is but a fractional inkling of what is really within you, what gives you life, breadth, and depth. But you can live in terms of that depth. And when you can experience it, you suddenly see that all the religions are talking of that. As Freud has shown, blunders are not the merest chance. They are the result of suppressed desires and conflicts. They are ripples on the surface of life, produced by unsuspected springs. And these may be very deep - as deep as the soul itself. The blunder may amount to the opening of a destiny. The All is everywhere, and anywhere may become the seat of power. Any blade of grass may assume, in myth, the figure of the savior and conduct the questing wanderer into the sanctum sanctorum of his own heart. Why re-enter such a world? Why attempt to make plausible, or even interesting, to men and women consumed with passion, the experience of transcendental bliss? As dreams that were momentous by night may seem simply silly in the light of day, so the poet and the prophet can discover themselves playing the idiot before a jury of sober eyes. Where the moralist would be filled with indignation and the tragic poet with pity and terror, mythology breaks the whole of life into a vast, horrendous divine comedy. Its Olympian laugh is not escapist in the least, but hard, with the hardness of life itself. Dream is the personalized myth, myth the depersonalized dream; both myth and dream are symbolic in the same general way of the dynamic of the psyche. But in the dream the forms are quirked by the peculiar troubles of the dreamer, whereas in myth the problems and solutions sown are directly valid for all mankind. Woman, in the picture language of mythology, represents the totality of what can be known. The hero is the one who comes to know...And if he can match her import, the two, the knower and the known, will be released from every limitation... The hero who can take her as she is, without undue commotion but with the kindness and assurance she requires, is potentially the king, the incarnate god, of her created world. The encounter and separation, for all its wildness, is typical of the sufferings of love. For when a heart insists on its destiny, resisting the general blandishment, then the agony is great; so too the danger. Forces, however, will have been set in motion beyond the reckoning of the senses. Sequences of events from the corners of the world will draw gradually together, and miracles of coincidence bring the inevitable to pass. The happy ending of the fairy tale, the myth, and the divine comedy of the soul is to be read, not as a contradiction, but as a transcendence of the universal tragedy of man. The objective world remains what it was, but, because of a shift of emphasis within the subject, is beheld as though transformed. The realm of the gods is a forgotten dimension of the world we know. And the exploration of that dimension, either willingly or unwillingly, is the whole sense of the deed of the hero. The values and distinctions that in normal life seem important disappear with the terrifying assimilation of the self into what formerly was only otherness. As in the stories of the cannibal ogresses, the fearfulness of this loss of personal individuation can be the whole burden of the transcendental experience for unqualified souls. But the hero soul goes boldly in and discovers the hags converted into goddesses and the dragons into the watchdogs of the gods. Modern romance, like Greek tragedy, celebrates the mystery of dismemberment, which is life in time. The happy ending is justly scorned as a misrepresentation; for the world, as we know it, as we have seen it, yields but one ending: death, disintegration, dismemberment, and the crucifixion of our heart with the passing of the forms that we have loved. Furthermore, we have not even to risk the adventure alone; for the heroes of all time have gone before us; the labyrinth is thoroughly known; we have only to follow the thread of the hero-path. And where we had thought to find an abomination, we shall find a god; where we had thought to slay another, we shall slay ourselves; where we had thought to travel outward, we shall come to the center of our own existence; and where we had thought to be alone, we shall be with all the world. The usual hero adventure begins with someone from whom something has been taken, or who feels there is something lacking in the normal experience available or permitted to the members of society. The person then takes off on a series of adventures beyond the ordinary, either to recover what has been lost or to discover some life-giving elixir. It's usually a cycle, a coming and a returning. The psychological dangers through which earlier generations were guided by the symbols and spiritual exercises of their mythological and religious inheritance, we today (in so far as we are unbelievers, or, if believers, in so far as our inherited beliefs fail to represent the real problems of contemporary life) must face alone, or, at best with only tentative, impromptu, and not often very effective guidance. This is our problem as modern, "enlightened" individuals, for whom all gods and devils have been rationalized out of existence. But if we are to grasp the full value of the materials, we must note that myths are not exactly comparable to dream. Their figures originate from the same sources -- the unconscious wells of fantasy-- and their grammar is the same, but they are not the spontaneous products of sleep. On the contrary their patterns are consciously controlled. And their understood function is to serve as powerful picture language for the communication of traditional wisdom. The function of ritual and myth is to make possible, and then to facilitate, the jump—by analogy. Forms and conceptions that the mind and its senses can comprehend are presented and arranged in such a way as to suggest a truth or openness beyond. And then, the conditions for meditation having been provided, the individual is left alone. Myth is but the penultimate; the ultimate is openness—that void, or being, beyond the categories —into which the mind must plunge alone and be dissolved. Therefore, God and the gods are only convenient means—themselves of the nature of the world of names and forms, though eloquent of, and ultimately conducive to, the ineffable. They are mere symbols to move and awaken the mind, and to call it past themselves. The agony of breaking through personal limitations is the agony of spiritual growth. Art, literature, myth and cult, philosophy, and ascetic disciplines are instruments to help the individual past his limiting horizons into spheres of ever-expanding realization. As he crosses threshold after threshold, conquering dragon after dragon, the stature of the divinity that he summons to his highest wish increases, until it subsumes the cosmos. Finally, the mind breaks the bounding sphere of the cosmos to a realization transcending all experiences of form - all symbolizations, all divinities: a realization of the ineluctable void. The hero is the man of self-achieved submission. But submission to what? That precisely is the riddle that today we have to ask ourselves and that it is everywhere the primary virtue and historic deed of the hero to have solved. Only birth can conquer death—the birth, not of the old thing again, but of something new. Within the soul, within the body social, there must be a continuous “recurrence of birth” a rebirth, to nullify the unremitting recurrences of death. For it is by means of our own victories, if we are not regenerated, that the work of Nemesis is wrought: doom breaks from the shell of our very virtue. Peace then is a snare; war is a snare; change is a snare; permanence a snare. When our day is come for the victory of death, death closes in; there is nothing we can do, except be crucified—and resurrected; dismembered totally, and then reborn. Once we have broken free of the prejudices of our own provincially limited ecclesiastical, tribal, or national rendition of the world archetypes, it becomes possible to understand that the supreme initiation is not that of the local motherly fathers, who then project aggression onto the neighbors for their own defense. The good news, which the World Redeemer brings and which so many have been glad to hear, zealous to preach, but reluctant, apparently, to demonstrate, is that God is love, the He can be, and is to be, loved, and that all without exception are his children. The multitude of men and women choose the less adventurous way of the comparatively unconscious civic and tribal routines. But these seekers, too, are saved—by virtue of the inherited symbolic aids of society, the rites of passage, the grace-yielding sacraments, given to mankind of old by the redeemers and handed down through millenniums. It is only those who know neither an inner call nor an outer doctrine whose plight truly is desperate; that is to say, most of us today, in this labyrinth without and within the heart. Alas, where is the guide, that fond virgin, Ariadne, to supply the simple clue that will give us courage to face the Minotaur, and the means then to find our way to freedom when the monster has been met and slain? 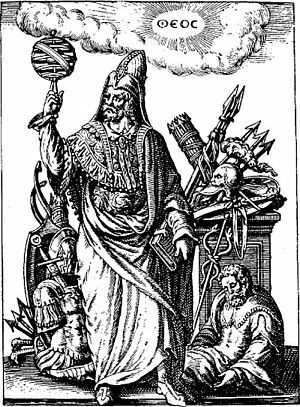 The asceticism of the medieval saints and of the yogis of India, the Hellenistic mystery initiations, the ancient philosophies of the East and of the West, are techniques for the shifting of the emphasis of individual consciousness away from the garments. The preliminary meditations of the aspirant detach his mind and sentiments from the accidents of life and drive him to the core. “I am not that, not that,” he meditates: “not my mother or son who has just died; my body, which is ill or aging; my arm, my eye, my head; not the summation of all these things. I am not my feeling; not my mind; not my power of intuition.” By such meditations he is driven to his own profundity and breaks through, at last, to unfathomable realizations. No man can return from such exercises and take very seriously himself as Mr. So-an-so of Such-and-such a township, U.S.A.—Society and duties drop away. Mr. So-and-so, having discovered himself big with man, becomes indrawn and aloof. This is the stage of Narcissus looking into the pool, of the Buddha sitting contemplative under the tree, but it is not the ultimate goal; it is a requisite step, but not the end. The aim is not to see, but to realize that one is, that essence; then one is free to wander as that essence in the world. Furthermore: the world too is of that essence. The essence of oneself and the essence of the world: these two are one. Hence separateness, withdrawal, is no longer necessary. Wherever the hero may wander, whatever he may do, he is ever in the presence of his own essence—for he has the perfected eye to see. There is no separateness. Thus, just as the way of social participation may lead in the end to a realization of the All in the individual, so that of exile brings the hero to the Self in all. 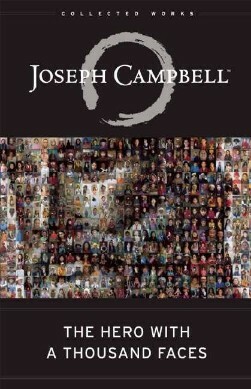 The Hero with a Thousand Faces is a book written by the American mythologist Joseph Campbell. 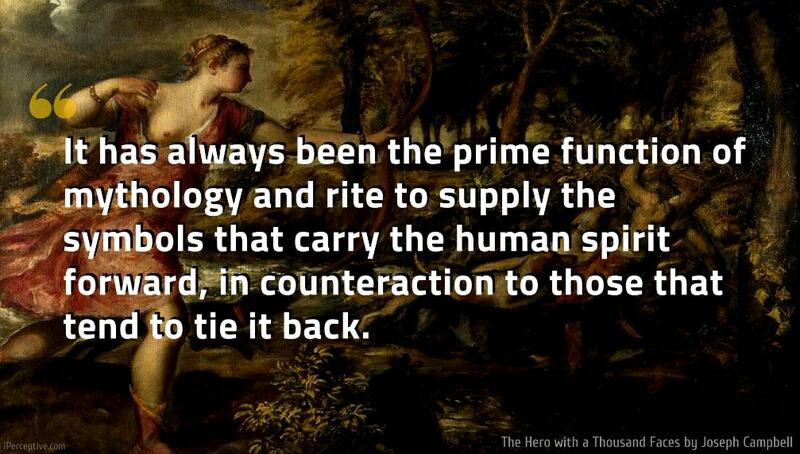 The book explores timeless topics such as the hero's journey in common world myths.